The Political Machine early predictions strike again! Some of you may recall that back in very early May we predicted that Kerry would pick Richard Gephardt as his running mate. Why? Because in The Political Machine simulations, the AI version of John Kerry kept wanting a running mate to win Iowa or Missouri. AI controlled John Kerry realized that he only needed to win one of those two states in the election to essentially wrap up the white house. At the beginning of June we noticed that that the governor of Iowa was a Democrat so we added Tom Vilsack into the game. Computer AI Kerry, btw, never picks John Edwards as VP. That's not saying that the real John Kerry won't pick John Edwards but the computerized version of John Kerry that only cares about winning the electoral college doesn't pick Kerry. BTW, The Political Machine added Vilsack into the game before the media started talking about him. The proof? The game went into manufacturing in mid June and Vilsack was in there from early June. I don't know the exact date someone first mentioned Vilsack in the media but the date the first release candidate of The Political Machine went to Ubi Soft is a known date and I suspect it was earlier. Either way, we are on record of talking about both of these guys very early even as the press had focused on Edwards, Richardson, Clark, etc (who are all in the game too btw in case you want to play with them). If you want want to learn more about The Political Machine, go here: http://www.politicalmachine.com/game.asp. 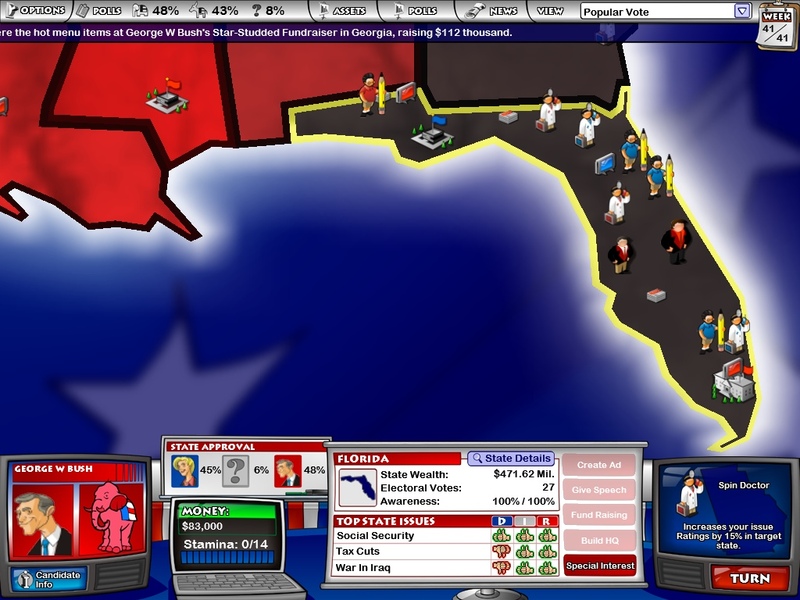 Screenshot (Bush and Kerry fight for Florida in 2004). Based on the Political Machine simulations, I don't really think that picking up a running mate to win Iowa or Missouri, would make that big of a difference in the political career of John Kerry. However, I must agree though that adding Tom Vilsack into the game would essentially make it a lot more controversial as it already created a buzz before the press even started talking about it. Adding on other political figures in real life whose opinions vary from each other would certainly make the entire game way more interesting.